An established leader in process and utility piping solutions, Notch Mechanical is a family business that recognizes the importance of the community we work in. It has helped us succeed and grow since our founding in 1972, and because of that we strive to give back to the community as much as possible through our regular civic involvement. 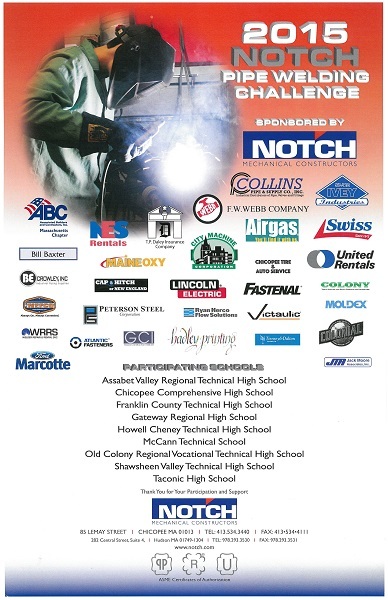 Since 1999, Notch has organized and sponsored the region’s premier competition for high school welding students from across New England. Each competitor spends several months practicing and then, in May, performs a 6″ open-root pipe weld using the SMAW (stick) process. The completed weld coupons are judged in accordance with ASME Section IX requirements. The “Top Notch Welder” receives a $500 cash prize and the winning school receives a $500 certificate for welding supplies. International Valve & Instrument Corp.
Tierney & Dalton Associates, Inc.
Welder Repair & Rental Service, Inc. Notch offers every employee one paid day of leave per year to volunteer in the community. The efforts of our employees are spread throughout the region and range from the Red Cross blood bank to the church or school next door.